“They make the best pasta,” I overheard the tall, middle aged man say convincingly as we casually wandered toward the Ferranti pasta stall at the Capitol City Farmer’s Market. The bearded shopper’s earnest words invisibly tugged my ear and led me to a table where samples of plump ravioli and spirals of green and white pasta were displayed. Soon we were chatting amiably with the proprietress, who makes her pasta from scratch every Friday night for the Saturday morning market. “I could talk for hours about flour,” she said as she talked about the three different grades of semolina. Made from the endosperm of durum wheat, the first milling is the coarsest and contains the most nutrients. This first grade semolina flour is used to make Ferranti’s fresh pasta. Also for sale were eight-ounce tubs of chunky tomato-basil sauce, so I bought one along with a one-pound bag of Plain and Spinach Radiatori. At home I noted the brief list of ingredients on the pasta package: 100% durum semolina, fresh eggs, water, and dehydrated spinach. Susan and I also selected freshly picked, spray-less spinach from AC&D Farms in New Plymouth for our weekly market basket. To the pasta, tomato sauce and spinach I added a small slab of Idaho Jersey Dream Feta Style Farmstead Cheese from Ballard Family Dairy in Gooding, a handful of salty Sicilian style green olives from Winco, and half a bunch of farm-fresh asparagus in order to make a simple, wholesome pasta salad for dinner. It took about 25 minutes to put together, and I barely had time to take photos before the entire dish was devoured by my husband and two grown sons. While the water is heating, chop the olives and cut the feta into small cubes. Place them in a large, shallow pasta serving bowl. Wash the spinach; drain. Slice spinach leaves into strips and add to serving bowl. 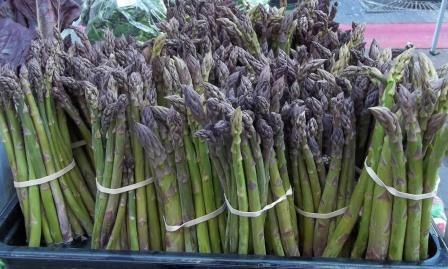 Wash and snap asparagus; cut into ½-inch long pieces. 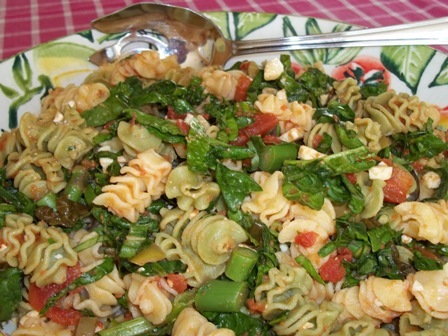 When the water boils, add pasta and asparagus to the pot. Cook 3-4 minutes or until pasta is al dente. Drain; pour hot pasta and asparagus over feta, olives and spinach. Top with tomato sauce and toss. Garnish with basil chiffonade. There wasn’t any springtime produce for sale yet at the Eagle Farmer’s Market when Susan and I shopped after a recent Saturday morning workout. I’d been hankering all week for fresh greens and I was secretly bummed as we nodded appreciatively at the handiwork of several artists and craftsmen on display in many of the stalls. We spied a few local producers of eggs, meat and sausage, and stopped to talk gardening with a couple of growers who offered young starts of cold-weather greens and herbs. Set smack in the middle of it all was a well-stocked display of locally dried spices from Starlight Herb Company. Scanning the rows and rows of small spice jars, tiny pods of star anise beckoned alluringly, while the exotic possibilities of garam masala tempted. 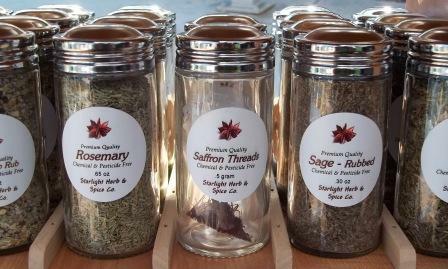 Numerous dried herbs, hand-crafted dry rubs and sausage seasoning blends teased the culinary imagination. Then, we both eyed the saffron and smiled at the price: Six dollars for half a gram of rusty red colored crocus stigma. Susan is a seasoned paella pro while, although I have tasted saffron-infused dishes many times, not once have I ever cooked with the costliest spice on earth. I relished the idea of doing some homework and finding out how to use it. Scanning the internet for suggestions I came across recipes for simple rice dishes and tasty-sounding sauces, as well as more complicated paellas and bouillabaisses. Not wanting to ruin my first attempt at cooking with saffron, I opted to prepare a fairly simple dish and forgo the risk of making a costly mistake involving a stock pot full of seafood. 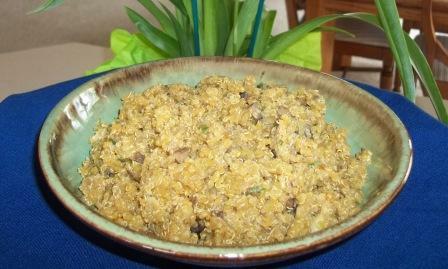 I found just what I was looking for on the Chicago Sun-Times Web site: a recipe for saffron-scented quinoa pilaf, which I modified in order to use the vegetable broth, mushrooms and ground cumin I had on hand. I also discovered an informative article about the spice on gourmetsleuth.com. Although I was initially disappointed in the lack of spring produce at the farmer’s market, it ultimately sent me in an unexpected, yet flavorful, direction. As a bonus, my husband, who normally balks at eating quinoa, enjoyed this saffron-infused dish. Place saffron threads in hot chicken or vegetable broth and let steep for 10 minutes. Rinse quinoa under cold running water; drain well. Place olive oil in a medium saucepan over medium heat and add minced onion. Cook until onion is soft, about 5 minutes. Add quinoa, garlic and cumin; cook, stirring for 1 minute. Add reserved saffron-broth mixture, mushrooms and bay leaf. Adjust seasoning by adding salt, if desired. Bring liquid to a boil, reduce to simmer, cover and cook 20 minutes. Remove pan from heat and let stand, covered, for 5 minutes. Stir in cilantro and, if desired, butter. Serve immediately. Shopping among the many vendors at the Capitol City Farmer’s Market recently I discovered a new spring flavor: green garlic. Looking like a fat scallion, green garlic is a young garlic plant that has been removed from the ground as the farmer thins out his rows, making room for the maturing plants that remain in the soil. 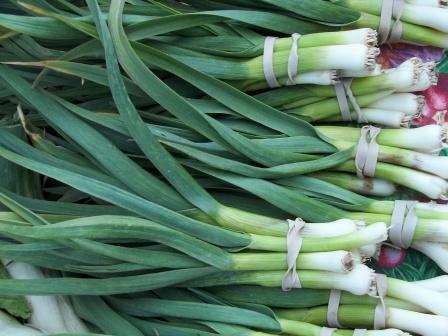 Green garlic has a pungent flavor that is not as sharp as a clove of raw garlic, but it isn’t as mild as a green onion, either. I sliced thinly the white part of two stalks, then added them to a scramble of sautéed beet greens and backyard chicken eggs. Surprised was I by the immature garlic’s hot bite. For an interesting write-up about the plant, read this article at TBD.com. Thanks to my local farmer’s market I have become more aware of the seasons. Moving beyond the knowledge that daffodils open in the spring and trees drop their leaves in autumn, my awareness has expanded to which herbs and vegetables are available locally during the first of the three growing seasons we have here in the Northwest. Last Saturday the tables at the Capitol City Farmer’s Market in downtown Boise were brimming with lush heads of leaf lettuce in contrasting shades of vibrant green and deep purple, trays of shallow water holding upright bundles of asparagus, and colorful clusters of bright red radishes. I brought home one of those bundles of ripe asparagus. The stuff grows like a weed in this area and I have been told by more than one local that before the construction boom two decades ago, the plant used to thrive in springtime along the many open ditch banks around town. 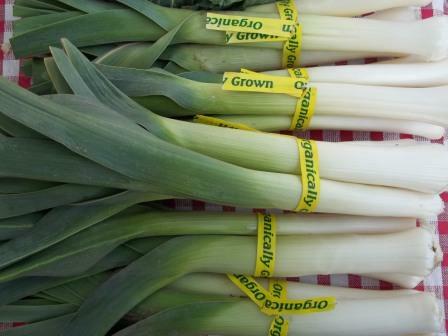 Anyone with a sharp eye and a sharp knife could cut stalks for free and have them with dinner. 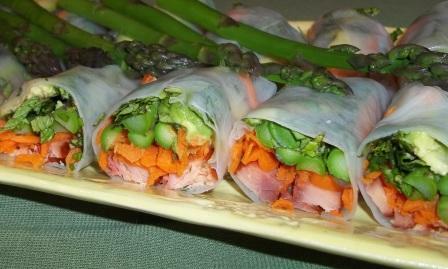 I incorporated the bundle I bought at the farmer’s market into spring rolls stuffed with smoked trout, mint and basil. They are especially tasty dipped into a Thai vinaigrette made with salty fish sauce, minced jalapeno, and tart lime juice sweetened with a little sugar. Bring 1 inch of water to a boil in a large skillet. Trim asparagus spears no longer than 6 inches; add to the boiling water. Partially cover and cook the asparagus until tender-crisp, about 3 minutes. Drain; refresh under cold water. Cut each spear in half lengthwise. Cut salmon slices into 12 strips no longer than 6 inches each. Center a strip of smoked salmon in the bottom third of the wrapper, leaving a 1-inch border on either side. Arrange 4 thick (or 6 thin) asparagus halves (overlapping as necessary) over the salmon. 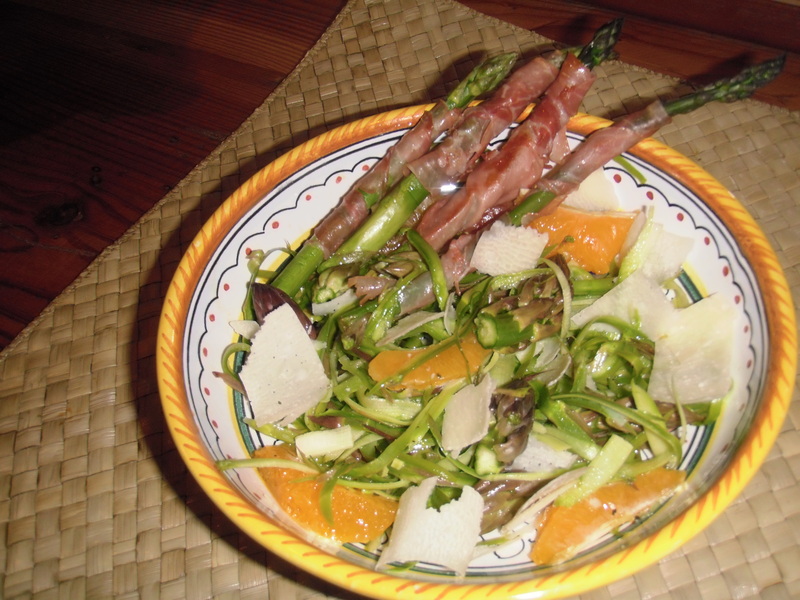 Top the asparagus spear halves with 2 avocado slices, 1 tablespoon carrot, and about 2 teaspoons each basil and mint. Fold the wrapper over the filling and roll into a tight cylinder, folding in the sides as you go. Repeat with the remaining wrappers and filling. Cut each finished roll in half. In a small bowl, stir together the fish sauce, lime juice, sugar and chiles until blended. Serve alongside spring rolls. Last Saturday was the 2011 season opener at the Capital City Farmer’s Market in downtown Boise. It was good to see several familiar vendors, like the man from the Almond Tree, whose reliable presence and stoic stance make him a familiar fixture. Susan and I always swing past his table for a sample, and he often greets us by wryly commenting, “These aren’t very good, you know.” His crunchy, candied almonds top my first salad of spring. This year Susan and I have a mission. We’ll shop the farmer’s market on Saturday, purchase the same foods, then compare what each of us does with the ingredients. 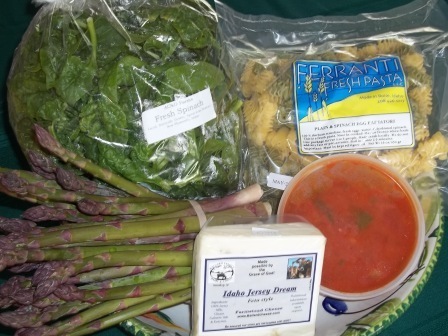 This week we selected fresh beet greens, candied almonds, organic leeks, wedges of Petite Basque (an aged sheep’s milk cheese), and the “Southern” dried seasoning blend from Molly’s Mills. I opted to create the obvious: Soothing bowls of leek-miso soup to counteract chilly springtime breezes, and a tender beet green salad with a simple dressing made using freshly squeezed orange juice and tangy orange zest. The following recipes will make two salads and two small bowls of soup. Add a loaf of crusty bread (fresh from the market, of course) to round out the meal. Melt butter in medium-size skillet over medium heat. Add leeks and sauté until lightly golden, about 3 minutes. Pour water into pan. Add miso. Heat until almost simmering. Do not boil. Maintain gentle heat and allow to steep while preparing the salad. Before serving, season to taste with a dash or two of salt. 1 small wedge Petite Basque cheese, cut into small dice. Wash and tear beet greens. Divide between two salad bowls. 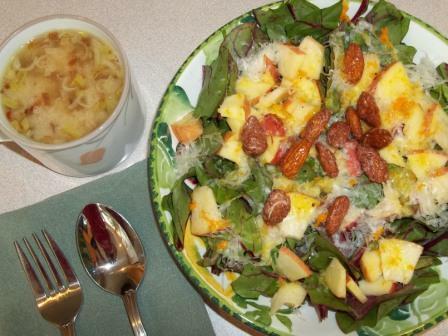 Top each with half the diced apple, half the cheese, and a handful of almonds. Using a microplane grater, zest half the orange. Place zest in a glass one-cup measure. Juice the orange; pour into one-cup measure with zest. Measure juice, then add half the amount of olive oil (you should have 2 parts orange juice, 1 part olive oil). Add Southern seasoning. Adjust taste. Pour over salad.